If you want to lose weight, gain muscle, reduce stress, increase energy or just generally look and feel healthier you’ve come to the right place. Oh, and you can win lots of cool Primal gear, too. 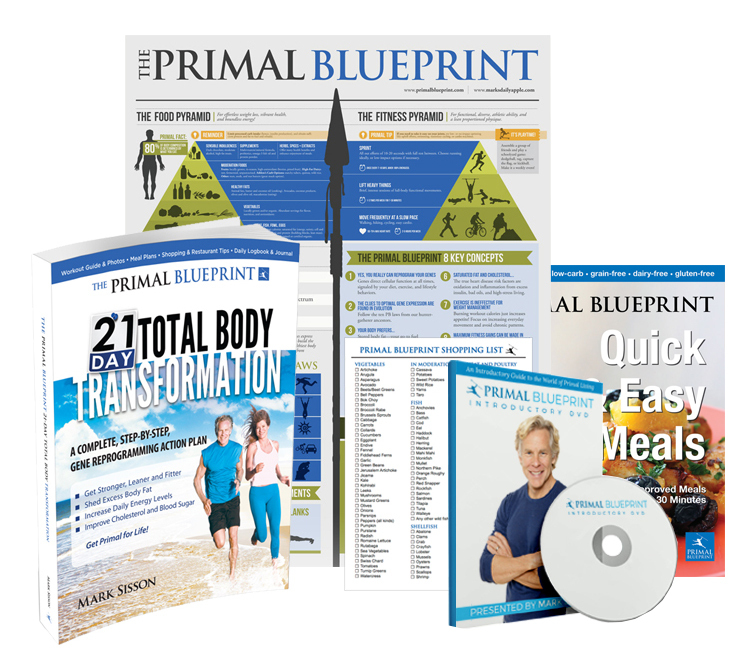 That’s right, it’s the annual Primal Blueprint 21-Day Challenge! Before we get to all the details, let’s kick things off with a simple contest. 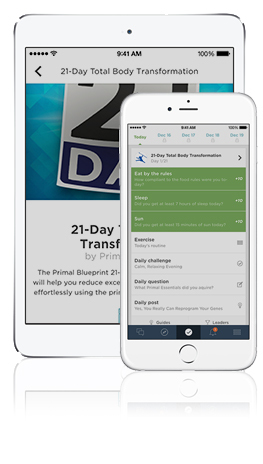 Click on over to this page and register for the free Primal Blueprint 21-Day Challenge in the Vimify app. That’s it! I’ll explain more about the app below, but rest assured that you’ll be entered to win a $100 gift certificate to PrimalBlueprint.com if you register for free. This contest ends at 8 pm PST tonight, January 12. A winner will be selected at random and everyone around the world is eligible, including people that registered before today. What Is the 21-Day Challenge? What’s the challenge? 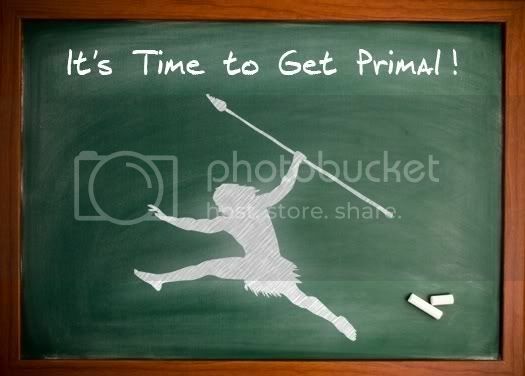 To get Primal, of course! 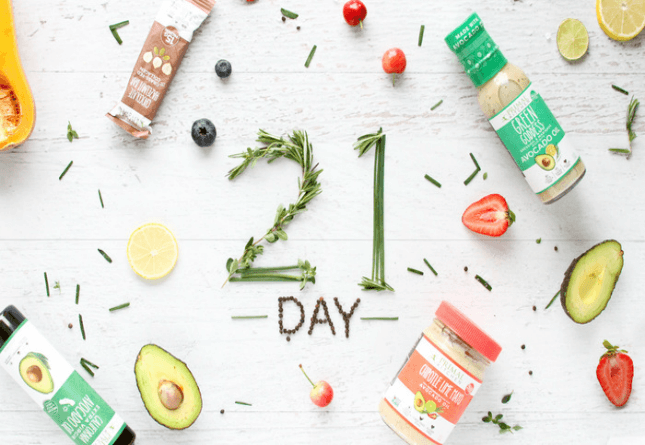 As you’ve already seen if you clicked the link above, this year I’ve put together a nifty infographic that summarizes the Primal Blueprint 21-Day Challenge. Click here or the image below to see the full version. (I encourage any bloggers out there to share this infographic using the html I’ve included below it.) Additionally, you can dig deeper into each section of the infographic by visiting this more detailed Primal Blueprint 21-Day Challenge page. In brief, this is the Challenge. Do it for just 21 days and the results will speak for themselves. Avoid sugar, grains, unhealthy fats, beans/legumes. Align your carb intake with your weight goals and activity levels. Move frequently at a slow pace: Get between 2-5 hours per week of moderate aerobic exercise. Lift heavy things: Conduct 1-3 brief, intense sessions of full-body functional movements. Sprint: Go “all out” once a week. Get 15 minutes of direct sun exposure each day. Play! Find time to let go, disconnect, unwind and have fun each day. No sign-up required. Anyone can participate. Just commit to the challenge, and check back every day for motivation and guidance. Articles over the next two weeks will be about taking steps to align your lifestyle with the Primal Blueprint. The third and final week of the challenge will be mostly comprised of reader-created content. That’s right, MDA readers (you!) will be running the show. Stay tuned. Above and beyond the challenge as outlined above, I encourage you to make your own personal challenges. Whether it’s eliminating or adding a certain food to your diet, losing weight, going barefoot more often, getting better sleep, or anything else, customize your goals to fit your needs and commit to 21 days starting now. Who Is the 21-Day Challenge For? I hold this 21-Day Challenge every year to encourage Primal beginners to give this way of eating, moving and living a try because I know it works, I know how empowering it is, and I know it changes lives. I also do it to motivate those that have been dabbling with the Primal lifestyle for a while, but haven’t fully committed or still have some room for improvement (myself included! ), to go all in and resolve to finally take control of their health. There’s something here for Primal veterans, too. It’s a good idea to revisit the basics from time to time. And hey, the chance to win free stuff isn’t half bad either. 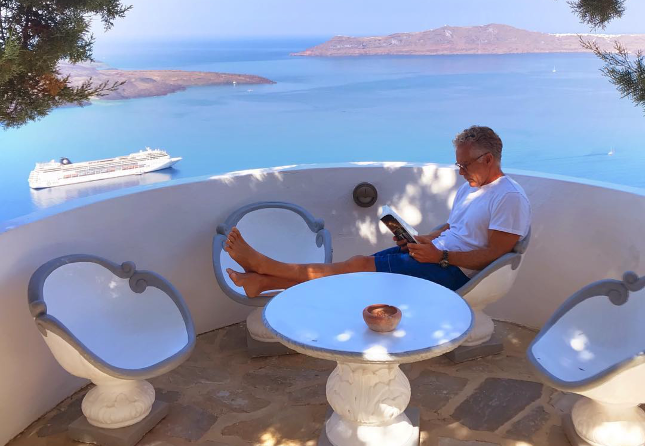 After many years of training clients and interacting with hundreds of thousands of Mark’s Daily Apple readers, my team and I have found that 21 days is the sweet spot for eliminating old habits and replacing them with new ones. It’s long enough to make legitimate progress toward reversing years of adverse lifestyle habits, long enough for most people to get past the low carb flu (if you experience it at all), and long enough to give the Primal Blueprint a fair shake, but not so long as to be seen as a daunting undertaking. In other words, anyone, including you, can give this a go for three measly weeks, and in that time you are bound to see results. If you have weight to lose, it’s reasonable to expect a reduction of three to seven pounds of excess body fat during this period, and to continue at that rate safely until you reach your ideal body composition. I told you all about the app last week. We’ve partnered with Vimify to bring you a free Primal Blueprint 21-Day Transformation App Challenge for your desktop computer or Apple iOS device. As you move through the Challenge, the app will be updated to reflect the day’s contests, your progress, and the progress of your friends. With the app, you’ll join a community of like-minded individuals working toward common goals. Compare, contrast, compete, encourage, and gently rib each other as you work through the contests and smash your stated goals. Purge your pantry of all non-Primal foods and restock it with Primal fare. 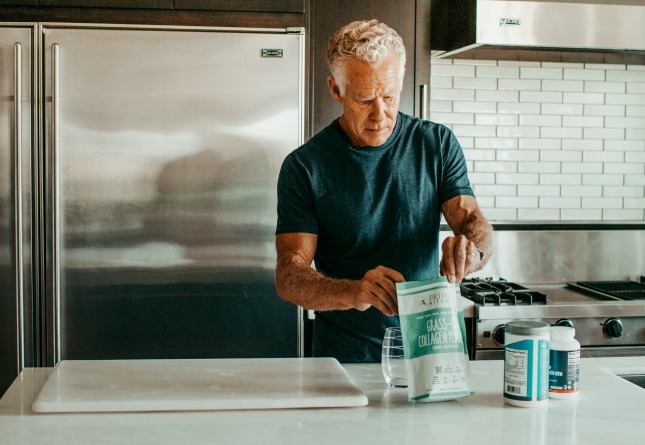 Take an hour out of your day to toss (or re-home) all the junk, grains, sugar, and vegetable oils in your pantry and hit the local grocery store or farmer’s market to stock up on meat, plants, nuts, and good fats. Invite friends to join you in the Challenge. Time’s a wasting for this one. Get your friends involved. Send them the link to this blog post. Suggest that they download the free app. The strength of this app lies in the community you build, the accountability it promotes, and the healthy competition it provides. You need people to get those benefits. Today is the last day you can download the app for free and participate in this round of the app challenge. Although it isn’t necessary to join the Challenge, it does enhance the experience. You have until this evening (PST) to download it, so get on it. The Digital Package. Receive immediate access to digital versions of the 21-Day Total Body Transformation (the official book of the Challenge that perfectly distills the essential aspects of the Primal Blueprint and shows you how to integrate them), plus an audiobook version (if you prefer to listen). You’ll also get digital versions of Primal Blueprint Quick & Easy Meals, the Primal Blueprint Poster (a graphic guide to the lifestyle), the Primal Blueprint Shopping List (a complete list of all Primal-approved foods), and an in-depth 90-minute video of me covering all the major elements of the Primal Blueprint lifestyle. You’ll also receive daily email encouragement for the duration of the Challenge, plus instant access to the app. The Fuel Package. Receive all of the above, plus physical versions of the book, the cookbook, the poster, and the shopping list shipped directly to your door. You’ll also get a bag of Primal Fuel, a Primal Fuel recipe book, and a Primal Fuel blender bottle. This is the best value of the three packages. The Essentials Package has everything from the Fuel Package PLUS bottles of Vital Omegas (my high-quality omega-3 fish oil), Primal Calm (my herbal stress-fighting blend), and Vitamin D (because sun is scarce this time of year). If you have been wondering how the supplements fit into the lifestyle, this is the perfect opportunity to give them a try and see how they work for you. Of course, these aren’t necessary to succeed or even partake in the Challenge, but they do make things easier and your success more certain. Choose your Transformation Package today to enhance this year’s challenge, and for added guidance and direction. The main challenge itself isn’t competitive, but that doesn’t mean we can’t have some friendly contests along they way! Over the course of the next three weeks Mark’s Daily Apple and sponsors will be giving away thousands of dollars in prizes. There will be new contests on Mark’s Daily Apple most days for the first two weeks (through Jan. 25) of the 21-Day Challenge, so check back daily! All contest prizes relate in some way to the Primal lifestyle. You won’t find any miracle weight loss pills, tummy crunching sling-a-ma-doo-dads, or whole wheat health blast jazzer snackers. Some contests will require a bit of leg work while others will require something as simple as commenting on a blog post. There is no limit to how many contests you can participate in. The duration of any one contest depends on the nature of the contest. Some will last a couple weeks (to give you time to complete the contest task) while others will be as short as one day. All deadlines are Pacific Standard Time. Contest prizes will be awarded either by a random drawing, by reader voting/polling or by an executive decision (who I think should win!). Some prizes will only be available to United States residents. If you live outside the U.S. and win a prize that can’t be shipped internationally an alternate prize of equal value will be awarded. I’m not being paid by any company for being featured in a 21-Day Challenge contest. New to the Primal Blueprint and Mark’s Daily Apple? 1. Primal Blueprint 21-Day Challenge page – On this page you’ll be introduced to the basics of the Primal Blueprint and can follow numerous links to learn more. 2. The Forum – I highly encourage you to use the forum during the challenge. In it you can start a “Primal Challenge Journal” to publicly state your goals and track your progress. Create a journal to receive positive feedback, advice and help along the way from the Mark’s Daily Apple community. 5. The Newsletter – Sign up on this page to get several free ebooks, a 7-day course on the fundamentals of lifelong health, and more. Tell your friends and family about the challenge so they can get Primal too! Best wishes and good luck on your first day of the Challenge. Check back tomorrow for a new contest and an article on going into the Challenge with the right frame of mind. Grok on! Yay! Let’s all set a good foundation for ourselves and may it transfer unto others so they take change in their life. Best of luck to all those participating in the challenge! The Vimeo app is great! I love the fact that each day I get my tasks and info instead of trying to remember it all by myself at the very beginning. We might actually get me to the end of this in great shape!!!! I have been Primal(ish) for 4 years. My daughter has thrown down the chicken bone and challenged me to do The Challenge. It is time! I actually started the challenge on Jan. 2nd, but don’t mind re-upping! I’m already feeling so much better! Good luck to all. I started exploring primal living last May and June and have had excellent results. My results have further stimulated a few others to try. I am not sure I am still a newbie or not, but this will be my first challenge. And it will be a challenge as well, as I will need to take a business trip to Saudi Arabia in the middle of the challenge. But a lifestyle change is a lifestyle change nomatter where life takes us, so I embrace that. Besides, there is plenty more sunshine there than we have seen here in Austin, TX lately. I did a practice week last week and I’m excited to really commit to the next 21 days, starting today. I prepped food over the weekend and am looking forward to working to results! Let’s go! Let’s do THIS!!!! Grok On!! Okay, I’m in. I need the focus. I’ve been primal for a week again but having trouble staying out of the primal treats. I’ve seen this challenge in the past years, but have never participated (fully). This year with the App and the other resources, I’m totally in. It’s going to be great being able to support and get support from the community and finally reach some goals! Thanks for doing this everyone! Ready-Set-Go! Can’t get past time zone in Vimify. Any advice? Did you see the time zone choices that are listed at the bottom of your screen – you need to scroll down thru them and select the one that applies. I selected Pacific but but the time zone choices just stay open and it doesn’t go back to the other screen. There may be an issue with your particular version of the iPhone. I would suggest signing up on the site and then logging in on your phone. Please reach out to marko@vimify.com directly if you run into any issues. I had the same problem, so I went back and started over, then it worked for me. Android users can carry their desktop with them, a little extra weight training for your daily work out. It seems to work fine in Chrome for Android — apps just let app providers collect big data on you, so I use a browser where I can anyway. Thanks Ion, I’ll give it a try. I’m in! Trying to get my friend to join it as well. I am going to use this as a support group for my lifestyle changes.. I’m pretty primal and I think I just have to keep dinking with it ( yes, that’s the technical term) until I get it right for me. So I will check in every day to keep me focused and to enjoy the culture of sharing and caring that helps keep me motivated. This challenge could not come at a better time. I am all in, for a couple of reasons. One my husband has been diagnosed with some serious medical conditions. Nutrition is going to help him. Two I need to lead by example, when he sees how awesome I feel and start to look. I pray he will jump in and follow. With all the positive support here. I know we can ALL do this. Thank you Mark for the challenge. Yes! I’m ready to kick it in to high gear for 2015! I am so ready to start this! It is the kick in the pants that I need to re-commit to my Primal lifestyle! Thanks, Mark! Is it primal? Make-up, hair dye, fake tans, fake nails etc. Huh, my comment under this one got deleted? (At least I’m pretty sure it posted, so many get blocked that it’s hard to keep track). Is it because I referred to Facebook as Selfie/Skunk (well spelled different – a synonym for an attention seeking female who makes the rounds, not that I can complain about them)/Cleavage book? That’s my assumption. If I were to call a guy a “player” though, would that be acceptable? Or did I offend someone with an opinion? If that’s the case, go cry to your mommy and don’t be so petty. Well I’ll repeat my thoughts and add some new ones, and save this as a draft in my email so I can copy and post later if need be after a possible revision. What I had said was that I also don’t consider piercings or tattoos primal, even if it was normal in ancient cultures and is normal in some modern groups that live like hunter-gatherers. In fact I find them pointless and sometimes silly, though I do think they can be aesthetically appealing sometimes. It’s something I’ll never get done to myself. I wonder about whether or not it’s primal to shave and cut hair, though I shave my facial hair and get haircuts, and since I’m conditioned to accept females getting rid of all or most of their body hair I admit that it shocks my “sensibilities” a bit when I see otherwise. I would need to know more history: if when the human species originated these practices already existed from their ancestors, assuming evolution is what brought us here (it’s inconclusive for me, as is the big bang, and gravity confuses me because why haven’t all the planets gone into the sun? Everything is in balance really well? After how much time?). I also said there’s something I don’t like about these 21 day challenges and that’s the fact I miss being able to read the regular posts, but I guess, on the plus side, they give Mark and the team more time to prepare for future posts. And that Signs of the Times (sott . net) is the other informative website I prioritize, which is full of articles about health, history, science, news, and more. I recommend checking it out. They support paleo and repost MDA stuff occasionally. After that I turned to cracked . com , great site for entertainment and somewhat educational. Besides those I’ve been spending lots of time on Facebook, not always productive.. but usually I’m not inactive out of pure laziness, more often than not it’s when my body would benefit from rest. I try to be in constant need of muscle recovery. What exactly is your point? Or do you have one? Several. Can you not deduce any? If that is the case I will make one more, deducing that based on what you just said about points, point is not a good metaphor for your mind. I’ve gotten some friends and co-workers to sign up. Very excited for them. It turned out this was not about weight loss at all. That is just a very pleasant side effect. You regain your body health, mental health, and vitality. Grok On everyone! The 15 minutes of sun is going to be hard in Minnesota these days, today it is -11 with the windchill. I do take VItamin D and walk to work which is 10 minutes. Same here and I am in Oklahoma (though thankfully we don’t get down that cold). Weather will be trending up soon here so looking forward to that. I’ll have to figure out how to stay occupied and amused but I want to cut back on drinking etc (well, yet again) and then I should naturally be more nourished because I won’t be putting so much stress on my system and depleting my organ reserves and it should become a cinch to afford decent food. I want to get healthier this year, happier naturally, and beastly beyond my wildest expectations, if possible. Anthony, I’m in Minnesota too. I did walk outside today and later took a 15 min siesta with the sun blazing through the window on my face. Probably doesn’t count :). At least on the sunny days we can imagine we’re getting sun! I also supplement with D. That’s the most difficult of the 21 day challenges for me! I don’t understand why people need a contest to get healthy. Isn’t just knowing that living the primal lifestyle will make you feel better than you ever have in your life make you make you want to do it? I know that’s why I started 2 years ago. People get motivated for different things in different ways. I think the point is to get them involved in any way possible, and hopefully the side effect of feeling so great and healthy ends up being the ultimate motivator to stick to it. Wish the app was available for android as the desktop version is awesome! I really like the way it took the whole book and narrowed it down to daily tasks. Very cool! I’m ready! All signed up. Yeah, I know my avatar is a seal and not a walrus. I thought of some animal hybrids/GMOs I thought would be cool. The bunny beaver. Ok, that one was a flop. Day One!!! Happy to be with a team of go-getters who are after their invincibility! Go team!! Great app! I love checklists! Let’s do it! Sunlight is proving tricky at the moment. Didnt actually see any sun today as it hide behind clouds all day, as it tends to do most the time this time of year. But other than that I consider myself as having made a good start. I think I read somewhere here that you get most of the beneficial effects of the sun even if it’s overcast. I guess not if the cloud are really dark gray though. It’s not only the UV rays, the light in the eyes counts too. That’s why I try to get outside even if it’s so cold that only my nose is out. I was introduced to primal blueprint 2 months back. I had gradually started to implement primal laws in my daily routine. But this challenge is a bonus. I have completed my Day 1 successfully. The only question I have is can coconut sugar be a part of the primal living? I was thinking the same thing and gave it a yes as long as it is within the 50 grams of daily carbs during the challenge. The challenge doesn’t require anyone to keep their carbs to only 50 grams per day. The ideal range for those wanting to lose weight is 50 to 100. For those who aren’t trying to lose weight, carbs can be higher. Count this gal in. Let’s get grokin! Been on here reading for over a year, Tried to do bits and pieces, but I really need to go cold turkey. Now, after the gluttony of the holidays, is a perfect time. Let’s do this!! Are there no Android users at all around here?? I’m still doing 21-day challenge, but I’m a bit bummed out I can’t fully join in. Oh, & you can actually access it in Chrome on your phone, too! I have downloaded the app and tried to sign up several times. I get to the timezone part and can’t seem to get past that. The sign up button won’t work for me. So sad. I was able to download the app, but then it asked for $9.99 to join the challenge. I thought this was free? Oops just saw the last line of the post… Yesterday was the last day to download for free. I downloaded it after midnight. Sigh. Ugh…nothing but headaches with this vimify app. Once I’m there, it’s a great app. It’s just not worth all the trouble to actually get in. Every time I click on it, the loading icon just spins and spins. I haven’t logged out or anything, but I’ve had to install and uninstall it every time I want to go in which is super frustrating. I have an iPhone 5c with iOS 8.1 (haven’t done the very latest update yet). I have the book and I’ll still follow along, but it’s a bummer that this app thing didn’t pan out… it’s really nice to have motivation and reminders right at your fingertips. By the way, as of this morning, the desktop version isn’t working for me either. I understand that this is not a tech-support forum, but I wanted to caution others in case they end up spending $10 on the challenge and ultimately won’t be able to use the app, if that’s something that’s important to them. Sorry for the trouble. Some people are getting a blue screen with a spinner when they open the app for the second time. We traced this issue back to notifications. Go to settings, open the Vimify app settings and switch “Allow Notifications” to on. That should solve the issue. Thanks for that! I finally was able to get app to start. However, now there is no option to get into the Jan challenge. Frustrating! But I will hang in there with the book. I was just excited about the app option too! I have the same problem – can’t get into the January challenge. The only option is for February, for $9.99. YES, it worked – thank you! It still hangs a little when I first click into the app…but after a few seconds I’m able to get in and use it with no issues. Thanks again!